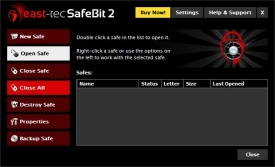 "Protect all of your sensitive information while also protecting your computer from viruses using East-tec Safebit!" Protect all of your confidential information that you would rather be unaccessible from intruders with East-tec Safebit. Using this software, you can encrypt all of your files and folders very easily and very fast using virtual disk drive technology to hide all of the files that you would strongly prefer to keep out of the hands of malicious intruders that may be looking to find and use this information against you - including your personal information. Safebit uses on the fly encryption that will encrypt folder and files very fast. All of the data that you would prefer to keep safe will automatically be encrypted and decrypted when you choose to hide them and retrieve them. The files and folders that you would like to keep safe will be accessible in a visually recognizable way since the information will be stored on, what appears to be, another hard drive on your system. However, this is a virtual drive, and anything that is stored on it will be automatically encrypted upon drag and drop. Proudly using a military strength encryption algorithm, you can be sure that your information will be as secure as possible, and making it difficult even for the most advanced malicious user that might want to find and steal your information - what ever that may be. You are also able to transfer encrypted files via email, flash drive, smart cards, portable hard drives, and more. You can move the files around however you please while still maintaining their encryption meaning that do not have to remain on the virtual drive if you would prefer. Want even more security? Require that you use a flash drive as a key to open up the files and folders that are encrypted. This means, that the files cannot be opened if you do not have that flash drive handy. This adds even more security to an already very secure application. 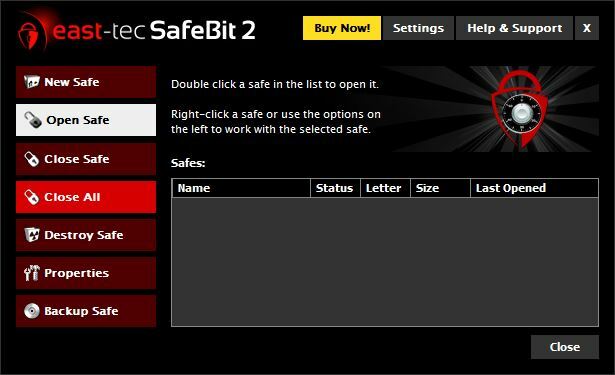 That's not all - East-tec Safebit will also protect you against computer keyloggers, trojans, viruses, and hackers. The application is able to detect keyloggers and will warn you of them, while also scanning for viruses and trojans as well. 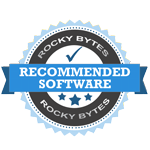 Get all the protection you need using Safebit today by downloading the application right here at Rocky Bytes!